Mix all ingredients except tortillas until blended; spread onto tortillas. Roll up. Wrap individually in plastic wrap. Refrigerate 2 hours. Heat oven to 375°F. Unwrap roll-ups. Trim and discard ends. Cut each roll-up diagonally into 10 slices. Place on parchment-covered baking sheets. Bake 10 min., turning after 5 min. 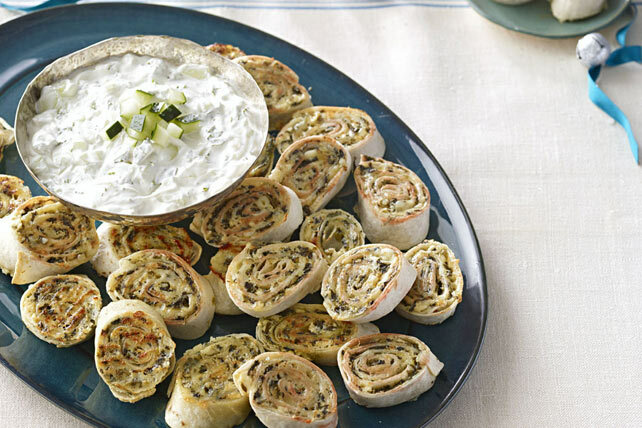 Serve with tzatziki, a classic Greek dip, on the side. Roll-ups can be refrigerated up to 24 hours before slicing and baking as directed.